Every year the friends and family of JMA gather to share in the holiday season with a themed potluck. Through this event the attendees taste buds travel the world. This year we not only visited South America but we also traveled through time, to the days before the arrival of Christopher Columbus. The name of this year’s event, “Pre-Columbian Tropical America”. As always our holiday potluck started with a traditional drink. At past events this has been tea, beer or liqueurs. This year we were treated to Pisco Sours, a cocktail originating in Peru. This sweet and sour beverage was a big hit among the potluck attendees, so much so that we ran out of the Pisco and lime juice. 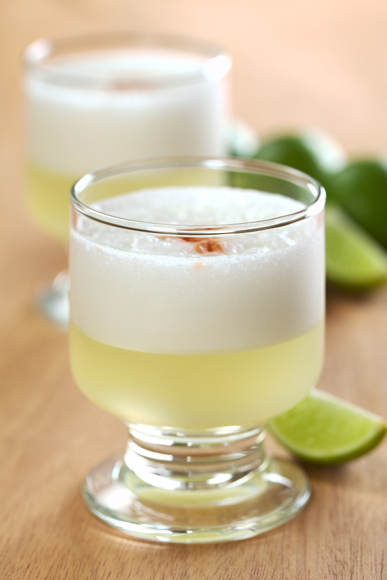 Get the recipe here: Pisco Sour. The dishes were placed on the table in preparation for dinner and before the meal began each dish was explained by its maker and the themed dishes were revealed. As you can see the table looked stunning with bright colours, and interesting textures topped with fresh garnishes. The pumpkin soup was served first. The warm purée was a nice way to awaken the palate in anticipation of the intense flavours of lime, hot peppers, cilantro and onion. A roasted wild boar on a bed of sweet potatoes was one of the highlights of the event. The boar was purchased from a local farm outside Stratford and had a lovely mild taste and juicy meaty texture. Unfortunately we don’t have the recipe for this dish. It was more of an improvised creation inspired on readings of Pre-Columbian cooking culture. It took us until dessert before we noticed that the Cuban rumba background music was on repeat, playing the same 3 minute song continuously all evening, a testament to the good food and good times. The desserts were no let down to the excitement of the mains. There were Alfajores, a sandwich like cookie with dulce de leche in the middle, and a tropical fruit salad in a light prickly pear juice. Sweet treats were not common in Pre-Columbian times, but we couldn’t go without dessert now, could we? We encourage you to try some of these exciting dishes. Let us know how it works out! This entry was posted in Community, Food and tagged Potluck, Potluck Recipes, Pre-Columbia Potluck, South American Food on 2015/01/20 by adminjma. Thanks for sharing all of these amazing recipes! The table does look amazing and colourful. It’s always a treat to take a trip through the taste buds at the annual JMA Christmas soiree!